The commercial images, taken on February 22 by imaging company DigitalGlobe, reveal an uptick in activity at a facility in Sanumdong, a suburb of the capital Pyongyang. North Korea has previously assembled some of its intercontinental ballistic missiles and satellite-launching rockets at Sanumdong. The release of the images follows an assessment by respected North Korea monitoring website 38 North that the Sohae satellite launch facility, which had been partially disassembled as part of disarmament steps, is now back to normal operational status after a flurry of restoration work in recent weeks — work that appears to have picked up after North Korean leader Kim Jong Un and US President Donald Trump’s failed summit in Hanoi on February 28. “We’re seeing a lot of vehicle activity at the Sanumdong facility and also at the rail transfer point where it would be loaded and taken to Sohae,” said Jeffrey Lewis, director of the East Asia Nonproliferation Project at the Middlebury Institute of International Studies at Monterey, who has studied the new images. Satellite launches use similar technology as ballistic missiles, and experts have long maintained that North Korea’s attempts to shoot satellites into space could help them develop viable long-range ballistic missiles. Lewis cautioned that it is impossible to know whether the North Koreans are preparing a military missile or a space rocket. It is also possible that the activity was a deliberate attempt to draw the attention of US spy satellites. The US State Department has declined to comment. Hanham believes a satellite launch is the more likely scenario because there has never been an ICBM launch from Sohae. She also says activity at the launch site should indicate about a week in advance whether a launch is imminent. “There’s never been a surprise launch from Sohae,” Hanham said. It’s unclear if the recent developments will affect how the White House moves forward with North Korea. North Korea’s missile program made strides in 2017, with Pyongyang saying it successfully test-fired three intercontinental ballistic missiles. Experts say the Hwasong-15, which was launched in late November, can likely hit much of the United States. Trump has touted as progress the fact that North Korea has not conducted any missile or nuclear tests in more than a year. Speaking Wednesday before the release of the latest images, Trump said it was “too early to see” whether Kim had restarted the country’s missile testing program but added that he would be “very disappointed” if that turned out to be the case. 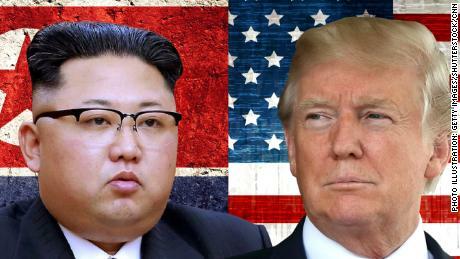 Trump had previously said the two sides departed amicably from the summit and left the door open for future negotiations. CNN’s Josh Berlinger contributed to this report.